Designed by BAKSON®, PC Patrol® is a Physical Intrusion Detection System for home and office security. A unique wireless hardware design that works with your computer to make it a burglar alarm system. Yes, a wireless security system with No monthly fees that works with your computer. Set up wireless motion detectors at your office or home and convert your PC to a wireless alarm security system in minutes. 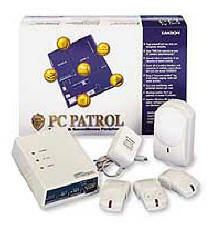 PC Patrol® has two security zones, perfect for any office, home, apartment, pharmacy, school, and data server rooms. Motion is detected in a zone based on a motion detector (infrared) not a camera, offering you more privacy. PC Patrol® alerts you of movement activity by sending alert messages to your pager or cell phone, capture video and use sound files to alert you if someone enters your office. PC Patrol®, keeps a simple .html event log with hyperlinks to video files for easy access. Order the Value Pack for $199 Today, Includes one Wireless Infrared Motion Detector. Designed for all Microsoft® Windows® Operating Systems: Windows 2000/ XP & NT Servers.